Fire without a doubt was one of the most important discoveries of humans. I would say cutting edges and fire were probably the two biggest discoveries that made an impact on our survival and technological advancement. Edges made it possible for humans to go beyond being scavengers and to become hunters. Fire made it possible to cook and thus increased the variety of foods we could eat which meant more protein and calories which made our bodies and brains grow and advance. Edges and fire are still up there with our highest priorities in a survival situation. In order of importance what are the priorities of a person thrust into an unplanned survival situation? I teach my students that their survival priorities in order of importance are SHELTER, FIRE, WATER then FOOD. Why this order? Statistically the number one killer of anyone thrust into an unexpected survival situation is panic. A person’s troubled and fearful mind runs wild with thoughts of what they don’t have instead of focusing on what they do have. They make mistakes. They attempt to walk out not assessing things like whether they even know the way out, how long before dark and often end up walking in circles till they are worn out, dehydrated and in trouble. The best thing you can do when realizing you are in this situation is to sit down and calm yourself and do an inventory of what you have. 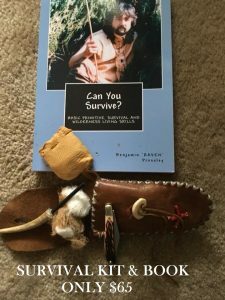 A prepared hiker/adventurer will have a survival kit and knowledge of basic survival skills. They will have a pocket knife and possibly some food and water at very least. If you don’t have these things what do you have to work with? Do you have shoe strings, a pocket knife, a compass, a lighter…what do you have to work with? 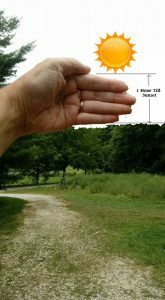 How long is it till sunset? When the sun sets the temperature drops and predators that hunt at night come out. Most people that die in a survival situation die from the mistakes they make or the number two killer statistically which is exposure not hunger or thirst. That is why shelter is a priority over water, food or even fire. 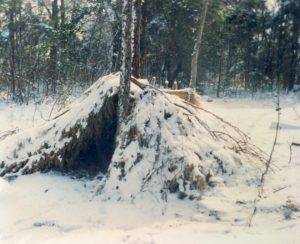 You can build a shelter that will keep you warm and protect you from most predators without having to build a fire right way. Water is a higher priority than food because a person can only last 4 days without water whereas a person can last 30 days or more without food depending on the health and weight of a person. If you don’t have water don’t eat. The digestive process uses a tremendous amount of water. Do you know the signs of exposure? Hypothermia, one condition of exposure, is the condition of the body when it is losing or has lost heat quicker than it can produce it. Hypothermia can occur at 50 degrees F believe it or not. Hypothermia at 50 degrees F usually happens when one has fallen into the water and suddenly their body loses heat unexpectedly. If you do fall into the water try to remember to ball up into a ball, drawing your knees close to your chest allowing your body to adjust to the temperature of the water before you swim out. Symptoms of hypothermia are uncontrollable shivering (early stages), redness of the skin, numbness, usually in the extremities, such as toes, fingers, hands and feet, slurring of speech and lack of concentration. In advanced cases there is no shivering and the person is usually incoherent. You must get the victim of hypothermia warm as quickly as possible. If you are with someone in this condition, and you are lucky enough to still have a sleeping bag, crawl into the sleeping bag with them with bare skin to skin contact. Even if you don’t have a sleeping bag shelter yourselves somehow, out of the wind and insulate yourselves in some manner, with natural debris or some material and do the same. Build a fire as soon as possible. In some situations, such as this, the fire may actually take a higher priority than shelter, acquiring shelter as soon as possible. If a person is in advanced stages of hypothermia no matter how warm a blanket or sleeping bag they have it will not help. In this state the person’s body is not producing enough heat to preserve by insulating them. You must warm the person. Warm liquids and a heat source are what is needed. If not treated early the victim will eventually experience frostbite and will begin to have blackening of the extremities, such as toes, fingers, ears and nose followed by entire limbs and will eventually lose the use of these body parts. The body will preserve the core (heart and brain) above other body parts in an attempt to stay alive. Be resourceful. Be creative in a survival situation. Think. The life you save may be your own or someone close to you. Control your circumstances as much as is possible. Don’t let things get out of control. Think ahead. 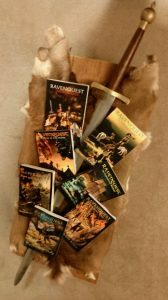 Read all 7 volumes of this exciting fantasy action series! Neel Carpenter tells me that the first white men to come to the highlands, where the main center, Ukarumpa, where he lives, is located, was around 1930. There may be places in Irian Jaya that have never had contact with outsiders. The further you get from a town or paved road, the more primitive the lifestyle of the people. There are plenty of places in Papua New Guinea where very few western clothes are worn. He reminds us, though, that it is rare to find a place where there is not some sign of western influence and living. To get anywhere the main form of transportation is plane. The fire-lighter (iysh hiyp; lit. 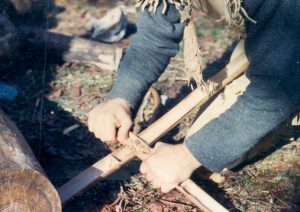 wood torch) utilized by the Wola is comprised of a piece of wood split down the center for three quarters or so of its length and some thin strips of cane. 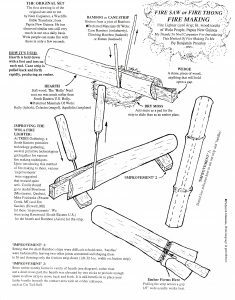 This method of fire making is sometimes referred to as a fire-saw (Cranstone 1961:90, Steensberg 1980:185), after the manner it is used to ignite a fire. To light a fire, a man wedges open the cleft in the fire-lighter’s body or hearth with a small bit of wood or a stone, places it on a nest of tinder with a strip of cane around it and holding the tinder nest by grasping it firmly at either end with the toes, bends over straight-leggedly and seizes the ends of the cane strip. He vigorously saws this to and fro, sometimes until it snaps. He then blows on the powdered embers that have fallen on the tinder generated by the friction, which burns a groove around the hearth body. The Wola call sawing a fire ‘lifting’ the fire-lighter: iysh hiyp menay (lit. wood torch lift). Although not always successful at the first attempt, it is a fairly reliable method of fire lighting, much depending on the dryness of the tinder used. While almost any dry and readily flammable material may be used for tinder, preferred tinders of the Wola are any variety of arefacted moss, the groundsel-like iriywaenj (Ergeron sumatrensis), the dead cephalium bracts of screw pines (Pandanus spp. ), and the puff ball fungus lomat (Lycoperdon maximum). When they require fire several times in the course of a day and wish to avoid the strenuous task of using a fire-lighter each time, persons may employ the latter fungus as a slow burning taper, for it smolders rather than burns and goes out less readily than a wood ember. They may also wrap a few hot embers in a tinder bundle and parcel them up with dry screw pine leaves, binding it all up tightly with a vine strand to prevent air from reaching the coals directly, so they cannot flare up, but only smolder slowly. In addition to using fungus tapers, smoldering parcels and glowing embers to supply fire when some distance from a homestead, the Wola also employ bundles of dry sword grass stems. These torches called hiyp, burn readily with a yellow flame, giving a good light and are particularly popular for illumination in the dark. Among the Wola these fire making implements belong to and are mostly employed by the men, though, there are a few capable women who can handle fire-lighters most succcessfully. They usually make it a point to carry the fire-lighter when going to remote forested areas but do not bother when they are near settled areas, for then they are never far from a house where they can acquire an ember. Fire saws continue to be popular to this day with as much as 47% of the men surveyed owned 38 between them. Their working life varies. Some are made and used only once and discarded in the forest, others are kept for months to a couple of years or so, periodically replenishing the cane strips as they run out. The average age of the fire-lighters in men’s possession was 19 weeks, ranging from 2 weeks to 2 years. Sometimes when they age, the bodies or iysha of fire saws break clean in two lengthwise, although that is not necessarily their finish, for they are often bound up and continue to be used. They are discarded as useless when they can no longer smoothly pull strands around them because they are scarred by too many saw grooves. Split bamboo can also be used for firesaw firemaking. The raw materials favored by the Wola are as follows: For fire-lighter bodies, the woods favored are hibish holly, magol celastra and sunglaes aquifolia. These are preferred because they are relatively strong timbers that burn readily when dry and are smooth grained, such that they reliably produce red-hot sawdust when frictioned with the cane strip. 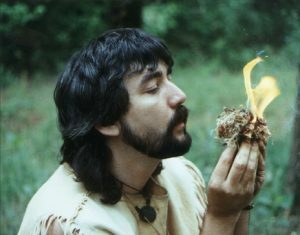 However, when caught in remote spots without lighters, men may fabricate temporary bodies, and discard them when they have finished with them, from a range of woods including bort silkwood, en spurge, gwai switchsorrel, hobaen suttonia, hog cola, huwshiy cunonia, inom stinging tree, maenget dillenia, op ochna, shongaen spurge, timbol spurge, waen wooly cedar and wok gamboge. If unable to find suitable wood nearby and desperate for fire, men will even use the stem of a tobacco pipe, though this is unlikely to be necessary, because the above trees, even those favored for fire-saws, are fairly common, and one at least will be growing nearby. Their pipes may differ from from those familiar to most westerners. They more resemble an oversized cigarette holder, consisting of a substantial sized tube with two holes in it, one for the tobacco which is wrapped in a leaf wad and the other to draw smoke into the mouth, no bowl for tobacco as we are accustomed to. The wood is cut 20-30 cm in length split lengthwise 3/4 of its length, wedged open with wood or a stone and allowed to dry, preferably a week or so, depending on the greenness of the wood and how quickly it is needed. Cleaving the wood and allowing it to dry is found to produce a more effective, efficient fire-lighter body. They say it allows a freer flow of air, aerating the combustible materials more effectively. The split stems of wolahaeriy cane bamboo or hulumb climbing bamboo are preferred for the friction strips of fire-lighters because they are pliant and tough. Neither bamboo is common, both grow in a few restricted locations only. If men run out of friction strips or fabricate makeshift fire-lighters some distance from sources of such bamboo, they may resort to less effective split climbing palm stems, probably haeluwp rattan at higher altitudes and tiy at lower ones. The friction strips are produced from a single internodal length of bamboo culm, cut off without the nodes attached. A single longitudinal cut down this hollow tube is made and it is then split into fire-saw strips by bending it in half across its axis, flattening it and breaking it into several narrow pieces. These are allowed to dry before using them. They are usually carried around green, however, wrapped lengthwise around the saw’s body and dry out while carrying them around. They are then peeled off as needed. New strips are always being cut as to assure a constant supply. Strips average 43 cm in length. The average time to produce the fire-lighter, by the Wola, including friction strips, was 11 minutes with stone tools and 12 minutes 45 seconds with steel tools. I am thankful to Neel Carpenter who writes to us from Papua New Guinea and was kind enough to share with us the information for this article from his experience and observations and from the book Made In Niugini by Paul Sillitoe (British Museum Publications, ISBN 0-7141-1584-3) . He works with many of the native peoples there through the Summer Institute of Linguistics. If you would like to contact Neel write: SIL Box 166, Ukarumpa via Lae, Papua New Guinea. 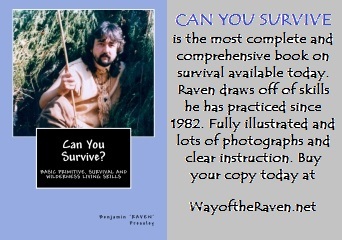 BE SURE TO VISIT THE WAY OF THE RAVEN STORE! Lots of unique and useful gift ideas!